Every year, Penguin employees pick a non-profit to benefit from their Global Walk, and this year we were the lucky winners! 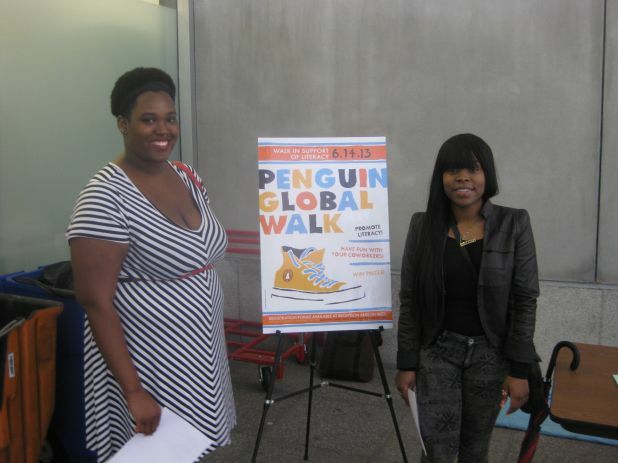 On Friday June 14th, hundreds of employees at Penguin USA strapped on their sneakers to march along the Hudson in support of Girls Write Now. Employees fundraised until the day of the event, choosing to walk as individuals or team up and compete for awesome prizes (and there were some awesome team names to boot, including “Walk This Wei,” “Victorious Vikings,” “Team Leftovers” and “Team Font Police”). Together, they raised more than $33,000 for Girls Write Now, breaking a fundraising record for their Annual Global Walk and showing that they really do walk the walk for young writers! Thanks to Penguin and all those hard-walking folks for demonstrating what great things can happen when a community of eager writers and readers has the full support of the industry that gives them a voice.